Welcome to Endfield House - Your Place by the Sea ! Endfield House is an elegant two-storey ocean-front, self catering apartment facing south above the beach at Chapel Bay on the Isle of Man. It is available year-round for family holidays. All linens are included, and there is free Wi-Fi throughout the house. It is close to public transport for island events and the glens, mountains, cottages and eco-tourism attractions. Spacious rooms and high ceilings provide generous space for six to eight people. The master bedroom has an ocean view, and an en-suite bath with tub and shower and a queen-sized bed. A second seafront bedroom has one single bed. There is a bright and spacious third bedroom with a double and single bed. In the hall, there is a large family bath with tub and shower. The upstairs lounge provides a get-away for reading and napping and also has a pull-out sofa that becomes a queen-sized bed suitable for children. On the main floor off the entrance hall is the large sea front lounge with large and comfortable couches and chairs, flat-screen HD television, DVD system and stereo. A decorative fireplace with marble surround adds to the relaxed atmosphere. Endfield House has a fully-equipped modern cook’s kitchen with a ceramic hob, convection oven and microwave. A kitchen table provides eat-in space and stools offer seating at the counter. The separate dining room provides seating for six to eight in elegant and comfortable style. A pass-through from the kitchen makes service easy. There is an additional WC and laundry room on the main floor. There is private covered parking in the rear garage. A sunny communal patio space is available for barbecues. Endfield House is located just ten minutes from Ronaldsway airport, and is near the main bus, steam rail and highway routes to Douglas for shopping and entertainment. Charming Port St Mary village is steps away, with shops, harbour-side restaurants and pubs. 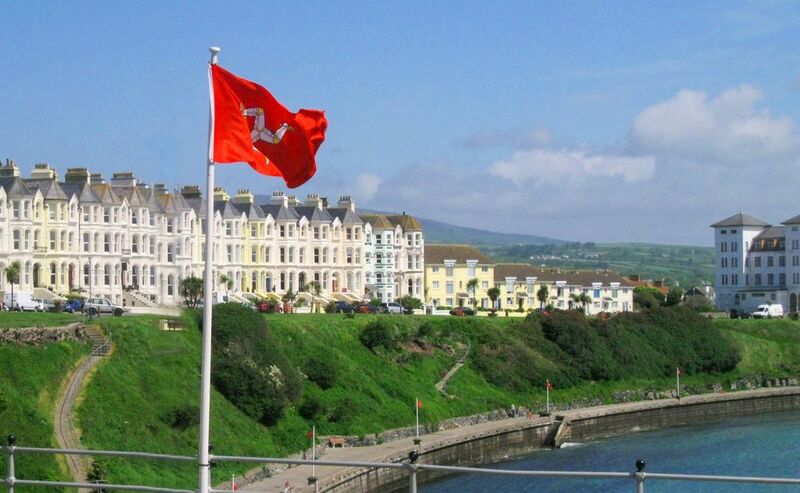 We came to the Isle of Man for the first time in 1996 to visit, and discovered a beautiful world in a small island. We bought Endfield House in 2001 and our family has enjoyed it with us every year since. We love the amazing and diverse scenery, the warm and friendly people and the variety of things to do at any time of the year. You can set your own agenda at your own pace. The island can be a calm refuge, but it is also vibrant in the cities and the villages. The island is rich in things to do. Spectacular coastal nature walks begin outside our door, and boat tours to see basking sharks, whales and other sea life begin in the harbour. There is world class motor racing, including the famous TT, the Southern 100 and the Manx Grand Prix. Because of the island's size (47 miles by 17 miles), everything is within easy driving distance. We love the sound of the Irish Sea rolling into Chapel Bay and outside the sailing marina and fishing harbor piers. Near our house are superb restaurants and pubs, good shopping, and convenient public transportation (bus and Steam Train!) into the capital of Douglas. Two electric fireplaces - in the dining room and the upstairs den. The Main Lounge fireplace is decorative only. Garage with private entrance to rear of apartment. Large and sunny South-facing main lounge with 9' bay windows overlooking the beach, the harbour and the Irish Sea! One covered parking space is available in the private garage behind Endfield House. Endfield guests must park on the LEFT side of the garage as shown on the sign. A large refrigerator is in the utility room, with an separate freezer beside it. A smaller fridge is under the counter in the kitchen. Endfield House books are available to read by all guests. Our library welcomes paperbacks or books you think others might enjoy! More than a dozen movie titles from which to choose, for adults and children. Front door landing is a perfect spot for evening drinks and watching the spectacular sunsets over the Irish Sea. Excellent boat tours round the island and to see the wildlife (Puffins, gannets, dolphins and even giant, friendly basking sharks are available in the harbour in the village. In addition to a bright sandy beach just below Endfield House, there are many water and adventure activities in Port St Mary and around the Isle of Man. Basking shark and whale watching, guided boat tours of bird habitat and sea life, spectacular coastal and mountain hiking and biking, ancient Celtic monuments and circles, and a yachting and sailing center directly in front of the house. In addition, local delights such as organic natural produce and dairy products, regular daily service on operating steam railway and horse-drawn trams make the island a time machine. For the adventurous, a new outdoor adventure / activity center features a challenging ropes course suitable for children and adults to have fun on together. There is also one of the UK's highest sets of Monkey tree climbing hardware which is a challenge for anybody with a head for heights. The ropes course has been built using a a continuous lifeline system, no clipping on and off as you go around the activities, great fun for all ages. A long zip line and a high ropes course is available for hardy climbers. Special Event periods such as the TT Races, Manx Grand Prix, and Southern 100 Races are in high demand.